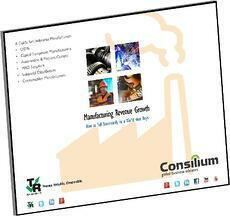 Manufacturing Revenue Growth - Free 33 Page Guide! Using this approach manufacturers can improve results and simultaneously create a framework of analytics and metrics which allow them to manage the preciously vague world of business development proactively just like operations! Download this free guide written by a former industrial manufacturing executive. Ed Marsh consults with industrial manufacturing companies to develop revenue growth strategies and tactically execute them. He's walked in your shoes! This eBook is loaded with facts, figures, case study examples and includes access to numerous additional resources. It tackles complex topics of digital strategy in a straightforward way. It's intended for a wide range of industrial manufacturers including OEMs, capital equipment, process control and automation manufacturers, MRO suppliers, industrial distributors and more. The approach, and the eBook, simply make sense. Download it today to learn how you can get started growing consistently. Guide to Growth - free download!